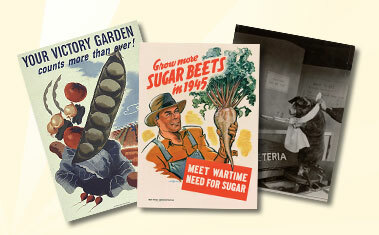 From the farm to the dinner table, explore the records of the National Archives that trace the Government’s effect on what Americans eat in this fascinating and entertaining exhibition. 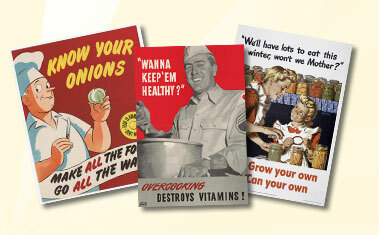 Learn more about how the government has affected farming, developed life-saving regulations, dealt with wartime shortages and rationing, and influenced our national diet on the National Archives and Records Administration's What's Cooking, Uncle Sam? website. 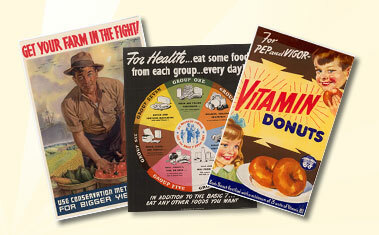 The exhibit catalog is available as a FREE eBook from the National Archives. Click HERE to read more about the interactive exhibition catalog for iPads and the exhibition catalog that is compatible with your mobile phone, computer, or reading device. The Nixon Presidential Library recently reopened the museum after a $15 million redesign of the permanent galleries. Guests can now experience a state-of-the-art learning environment that inspires critical thinking about the life and career of our 37th president and his era. The Richard Nixon Presidential Library and Museum is one of fourteen Presidential Libraries operated by the National Archives and Records Administration. It is open year round with the exception of Thanksgiving Day, Christmas Day and New Year's Day. The Museum is fully handicapped accessible. For more information about museum visitor hours and researcher hours, call 714-983-9120 or go to www.nixonlibrary.gov.